During my latest Mary Poppins watch, I noticed several parallels between the musical and the Harry Potter series. Below are the seven extraordinary similarities I observed. Just like Hermione Granger, Mary also possesses a bag that is a lot larger than it looks. One that stores everything from hat stands to lamps, not quite what Hermione has in hers. Harry Potter has several magical mirrors, one of them being the Mirror of Erised. This fantastic mirror reveals one’s deepest desires. In addition, Harry’s mirror in Prisoner of Azkaban speaks to him just like Mary’s does to her. That’s the spirit, dear,” said his mirror sleepily” (Prisoner of Azkaban 68). Probably one of the musical’s most iconic objects, Mary’s umbrella grants her the ability to fly. On the other hand, Hagrid’s flowery umbrella hides the pieces of his wand, enabling him to use it for magical purposes. One spell I wish I could perform and would make my life so much easier. Both worlds have easy methods of cleaning, whether it’s a click of the fingers or a simple incantation. Harry accidentally blows up his aunt Marge in the third installment, whereas a remarkably strong gust of wind hilariously blows away the other nannies in line for the position. In Harry Potter, Amortentia smells different to each person based on what attracts them. 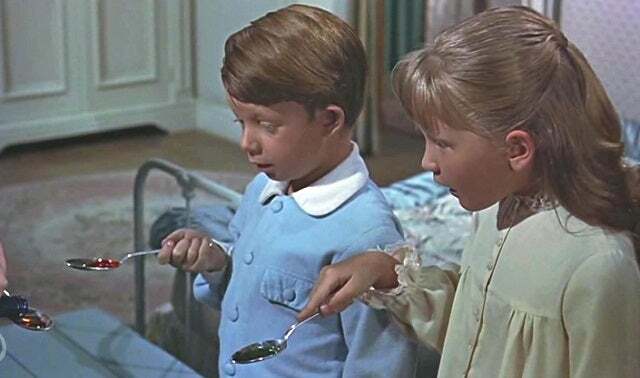 On the other hand, Mary’s magic medicine tastes different based on the individual’s preferences. Characters from both of these works get transported into different worlds or times. Harry has Dumbledore’s Pensieve, which allows him to see certain memories. In Mary Poppins, Bert’s paintings take them to an animated world full of dancing and singing animals. Are there any other magical parallels that you noticed? Let us know in the comments! Previous story Publishing Partners Announced For “Fantastic Beasts” Merchandise!